There are many possible uses for this clever device. Just One Of the Effects Possible: A mini deck (supplied), is shown and shuffled, then a card is selected and returned to the deck. While the spectator mixes the cards, the performer brings out a small paper bag, claiming he has a pet alligator inside. If this weren`t outlandish enough, he also claims the alligator can do a card trick. 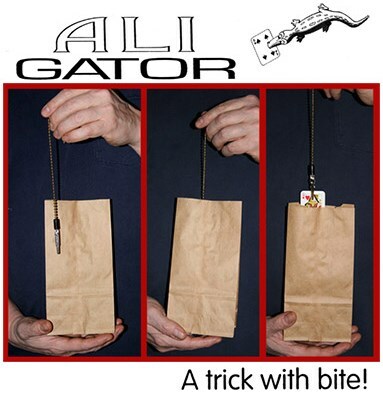 He reaches inside the bag and slowly lifts out a chain, on the end of which is an alligator clip. The mixed deck is dribbled into the bag, then the Gator is lowered in. After only a second or two of sniffing, Gator is raised out of the bag with a card in it`s mouth! Unfortunately, it`s the wrong card! The performer asks the spectator to concentrate harder as he lowers Gator back into the bag. After only a short instant, Gator comes out of the bag again, this time with the correct card!